A look at the rumors around the major leagues, beginning with the pitching staff of the Miami Marlins. The Blue Jays have optioned left-hander Colt Hynes to Triple-A Buffalo and called up left-hander Jeff Francis from Triple-A. ARLINGTON, Texas -- Before Monday's game against the Texas Rangers, the Yankees recalled outfielder Zoilo Almonte from AAA Scranton and designated LHP Jeff Francis for assignment. Masahiro Tanaka apologized Friday to the New York Yankees, his teammates and the team's fans for being sidelined by a partially torn ligament in his right elbow. 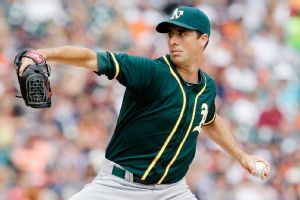 The New York Yankees acquired pitcher Jeff Francis and cash in a trade with the Oakland Athletics on Friday for a player to be named, the team announced. BALTIMORE -- Joe Girardi has no idea who will start Sunday in place of the injured Masahiro Tanaka. The newly acquired Jeff Francis seemed like he might be a logical choice, except he last pitched July 2 and only threw 14 pitches. BALTIMORE -- The Yankees acquired journeyman Jeff Francis on Friday.Jeff Francis#29 RPOakland Athletics2014 STATS GM10 W0 L2 BB3 K14 ERA5.89What it means: Brian Cashman will try to find little pieces to put together this pitching puzzle. METS (35-41, fourth place/NL East) vs. OAKLAND ATHLETICS (47-29, first place/AL West)Tuesday: RHP Bartolo Colon (7-5, 3.88) vs. LHP Scott Kazmir (9-2, 2. The Reds brought up left-hander Jeff Francis from Triple-A Louisville to start the second game of their makeup doubleheader against the San Diego Padres on Thursday.